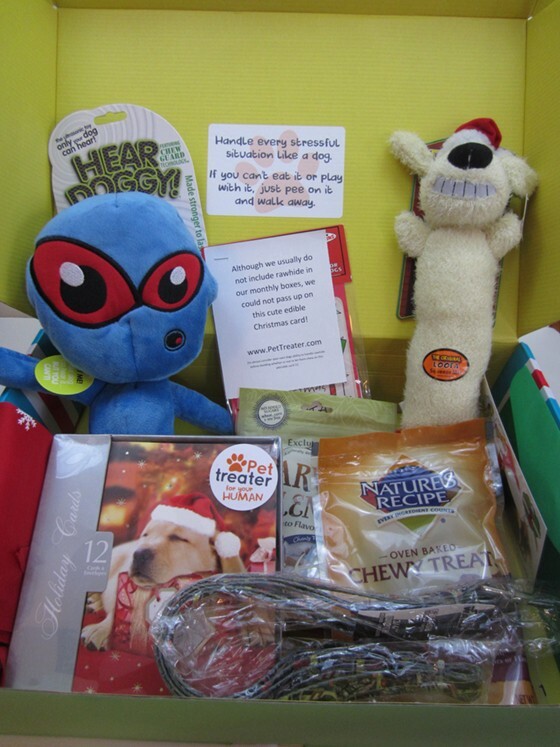 Pet Treater is a subscription box for dogs. Select from small (up to 20 pounds), medium (21-50 pounds), and large (51+ pounds). This review is for a large dog box. My dog Nyx, a Rottweiler, is about 82 pounds right now. There was no information card in this box, but it did include a letter addressed to Nyx! This is an older item, not a tie-in with the current movie. (It says copyright 2012 on the tag.) Unfortunately, it smells funny and isn’t thick/sturdy enough to use with Nyx. I’ll be passing this on to someone else. This is a custom item and can’t be ordered online. However, you can find sites for bulk ordering custom bandanas, and I based the value on those. This isn’t quite big enough to fit around Nyx’s neck (and tie it so it stays on). That is something I worry about with dog boxes, in general. A 51 pound dog is different from an 80 or 90 pound dog, and item sizes that will work for 51 pound dogs might be inappropriate for, say, Rottweilers. This is a cute idea – a card made from rawhide and printed with edible ink. Although the rawhide for this particular card is sourced from Thailand, the Crunchkins site does not promise not to source products from China. This lasted Nyx exactly 60 seconds. But they were 60 seconds of happiness! I do wish plush toys were more durable or that perhaps there had been something made of hard rubber (since that is not as easy for Nyx to destroy). I’m encouraged by the inclusion of these treats. They’re sourced and made in the US and available from sellers that stock current product lines in current packaging. Nature’s Recipe treats are made in the US; they source their venison from New Zealand (according to the comments on this Facebook post). This particular product is only available from third party sellers on Amazon and does not appear on the Nature’s Recipe website, though. I am not sure if it is discontinued, seasonal, or in the process of being reformulated. The bag has a sell-by date of October 2016, though. These are free of corn and wheat and also don’t have any chicken, so I am probably going to be able to give them to Nyx. These are cute and I’ll probably use them eventually. (My general strategy for holiday cards is to buy them on clearance at Target a few days after Christmas, then use the same ones for years until I run out…) It appears these were packaged in sets of four different designs and that the sets were split up? They’re definitely less random than some of the other “human” items from Pet Treater. Verdict: I calculated a value of about $70 for the December 2015 Pet TreaterDog Subscription Box. This is about the same as last month, although I think the items were a little better/more useful. Some were still closeouts, of course, and I am disinclined to trust the values listed above too much because so many things are only available from third party sellers on Amazon. 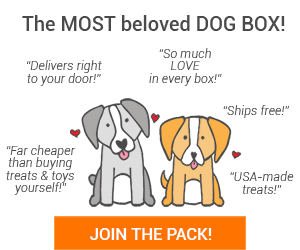 However, if you don’t mind a few closeouts and older items, this box *does* have a lower price than many other dog subscriptions.